You may think you know the city, but do you really know Edinburgh? Check out our fun facts below – we didn’t even know all of them! 1) Edinburgh was the first city in the world to have its own fire service in 1703. However, it was a volunteer fire brigade! Princes Street Gardens today, minus the Loch! 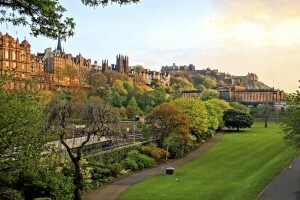 2) Princes Street gardens is best known for being a great spot for relaxing on a sunny day. Although it was once a body of water known as ‘Nor Loch’. The loch was heavily polluted and women suspected of being witches were thrown into the waters. If they floated, they were executed. On the other hand, if they drowned they had no kinder fate. 3) Rose Street’s name rumoured to signify that the street was once a popular location for prostitutes and their clients where the term ‘picking a rose’ was synonymous for soliciting a prostitute. However, it’s more likely to be named after the national symbol of England – just as Thistle Street was named after the national symbol of Scotland. 4) The word ‘caddie’ is now commonly associated with golf, but is thought to have originated as a description of the men who were hired to carry pails of water up the tenement flats in Edinburgh’s Old Town. 5) The Mound is not a real hill – it was created in the 1780s using earth from the foundations of Princes Street. 6) Edinburgh’s Royal Mile is actually one mile and 107 yards long. 7) Sherlock Holmes author Sir Arthur Conan Doyle lived in Edinburgh and studied medicine at Edinburgh University. 8) Sean Connery was born and grew up in Edinburgh. 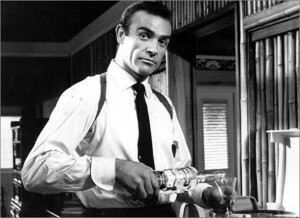 As a boy, he delivered milk to Fettes College, where the fictitious character of James Bond was educated. 9) Edinburgh has more listed buildings than anywhere else in the world. 10) The National Monument on Calton Hill was supposed to be modeled on the Parthenon in Athens, however the project embarrassingly ran out if money and no-one has ever completed it. It is informally dubbed ‘Edinburgh’s Shame’. 11) Edinburgh’s residents are the happiest of the largest 10 cities in the UK and 97% are satisfied with Edinburgh as a place to live.